A smoothie is a thick and creamy beverage made from pureed raw fruit, vegetables, and sometimes dairy products (e.g. milk, yogurt, ice-cream or cottage cheese), typically using a blender. Smoothies may be made using other ingredients, such as water, crushed ice, fruit juice, sweeteners (e.g. honey, sugar, stevia, or syrup), whey powder, plant milk, nuts, nut butter, seeds, tea, chocolate, herbal supplements, or nutritional supplements. A smoothie containing dairy products is similar to a milkshake, though the latter typically contains less fruit and often uses ice cream or frozen yogurt. The healthfulness of a smoothie depends on its ingredients and their proportions. Many smoothies include large or multiple servings of fruits and vegetables, which are recommended in a healthy diet and intended to be a meal replacement. However, fruit juice containing high amounts of sugar can increase caloric intake and promote weight gain. Similarly, ingredients such as protein powders, sweeteners, or ice cream are often used in smoothie recipes, some of which contribute mostly to flavor and further caloric intake. As products typically using raw fruits or vegetables, smoothies include dietary fiber (e.g. pulp, also skin and seeds) and so are thicker than fruit juice, often with a consistency similar to a milkshake. 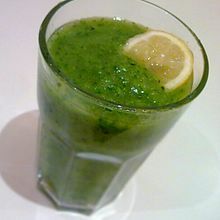 Smoothies, particularly "green smoothies" that include vegetables, may be marketed to health-conscious people for being healthier than milkshakes. A "green smoothie" typically consists of 40–50% green vegetables, usually raw green leafy vegetables, such as spinach, kale, swiss chard, collard greens, celery, parsley, or broccoli, with the remaining ingredients being mostly or entirely fruit. Most green leafy vegetables have a bitter flavor when served raw, but this can be ameliorated by choosing certain less-bitter vegetables or combining with certain fruit (e.g. banana softens both the flavor and texture). Some blender manufacturers now specifically target their products towards making green smoothies and provide a booklet of recipes for them. Many different smoothies are part of Indian, Mediterranean, and Middle Eastern cuisine. Fruit sharbat (a popular West and South Asian drink) sometimes include yogurt and honey, too. In India, the lassi is a smoothie or milkshake comprising crushed ice, yogurt, sometimes sugar, and often mango; in the south, pineapple smoothies made with crushed ice, sugar and no yogurt are more popular. Health food stores on the West Coast of the United States began selling smoothies in the 1930s associated with invention of the electric blender. The actual term "smoothie" was being used in recipes and trademarks by the mid-1980s. ^ "Smoothie". Oxford Dictionary, Oxford University Press. 2018. ^ a b c Jeff Olsen (26 July 2017). "Mayo Clinic Minute: Get smart about smoothies". Retrieved 25 October 2018. ^ "Get the Facts: Sugar-Sweetened Beverages and Consumption". Centers for Disease Control and Prevention, US Department of Health and Human Services. 23 October 2018. Retrieved 25 October 2018. ^ Boseley, Sarah (2013-09-07). "Smoothies and fruit juices are a new risk to health, US scientists warn". The Guardian. ISSN 0261-3077. Retrieved 2016-03-27. ^ a b "Rethink Your Drink". Centers for Disease Control and Prevention, US Department of Health and Human Services. 23 September 2015. Retrieved 25 October 2018. ^ Zavasta, Tonya (2009), "Smooth Moves: Enjoy the Benefit of Green Smoothies and Puddings", Raw Food and Hot Yoga, p. 39, ISBN 0-9742434-9-3, A green smoothie...is a mixture of about 60 percent fruit and 40 percent leafy greens blended together in a delicious, nourishing beverage. ^ Smith Jones, Susan (2008). Health Bliss, p.179. ISBN 1-4019-1241-9. "...about 50-60 percent fruit and 40-50 percent greens." ^ Caldwell, Kim (2009) How Green Smoothies Saved My Life: A Guide for Using Green Smoothies, Uplifted Thinking, and Live Food to Enhance Your Life, p.12. ISBN 0-615-30290-4. ^ "Drink your fruits and vegetables?". Harvard Heart Letter, Harvard Medical School. May 2018. Retrieved 25 October 2018. ^ (Nov 2008 - Jan 2009). Organic Gardening, p.44. Vol. 56, No. 1. ISSN 1536-108X. ^ Brown, Ellen (2005). The Complete Idiot's Guide to Smoothies. p. 3. ISBN 1-59257-318-5. ^ "Smoothie". Online Etymology Dictionary, Douglas Harper. 2018. Retrieved 25 October 2018. Wikimedia Commons has media related to Smoothies.